Where is the figure 8 pools? 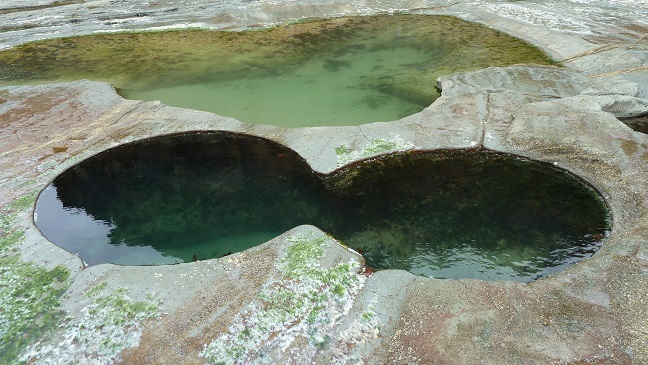 The Figure Eight Pools can be found along the coastal walk in the Royal National Park. There are 2 ways to get there. One by starting at the Otford lookout. You can do a loop which is around 14km’s. The other is by starting at the Garawarra Farm car park. This bushwalk is approximately 6km’s. I recommend starting at the Otford lookout. The landscape is constantly changing from forest, to ferns, to palms and cliff’s. The 14km bushwalk goes in no time. Well it took me 4 hours which included lunch at the Figure 8 Pools but I enjoyed every minute. From the Otford lookout take the coastal walk and head down the cliff track. This will lead onto the Garawarra Ridge management trail. After about 2km’s turn right onto the walking track. This track will take you through Palm Jungle and down to Burning Palms Beach. When you hit the beach turn right and walk towards the headland. You’ll need to navigate over some large boulders. It’s not all that hard but I wouldn’t want to do it when I’m seventy. Once at the headland walk your almost there. Go around the cliff and a few more boulders to the second headland. The Figure 8 Pools can be found on the second headland near the waters edge. The Pools can only be accessed at low tide. The link below will give you tide times. So check the times before you go and ensure you arrive at the figure 8 pools at low tide. The Figure 8 Pools is one of the main 3 attractions along the coastal walk. Eagle Rock, and Wedding Cake rock are also worth a look. The map below will assist you with directions. Figure 8 Pools Trail Map. Figure 8 Pools Photo Gallery. Google Map Link. The figure 8 pools trail head can be found at the Otford lookout carpark in the Royal National Park. Google Map Link. For a shorter hike to the figure 8 pools you can start at the Garrawarra Farm Carpark. Bushwalk, bush walk, wedding cake rock, figure 8 pools, track, trail, bush, Sydney, Sydney South, NSW, Australia, Royal National Park, hike, hiking, trek, where is, whereis, figure eight pools.